I spent this Memorial Day reading about war; specifically, about the “Great War,” the First World War. 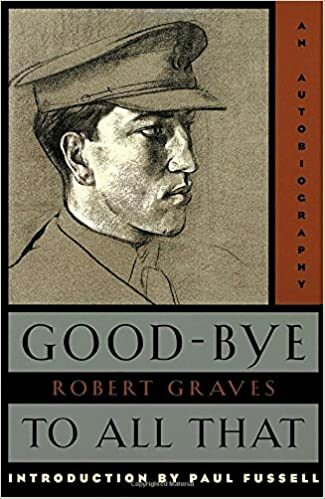 One hundred years ago, Robert Graves, fresh from school, left his home in Great Britain and went to war in France. He recounts his experiences and observations in Good-Bye to All That, lauded as one of the best memoirs of the Great War. Graves, if you don’t know of him, is best known for his biographical novel, I, Claudius (or, as we pronounce it in this house, “Eye Clav Divs,” because of the Imperial Roman font used on the BBC dramatization). If you haven’t read I, Claudius, put it on your TBR list, as it’s well worth reading. But my intention here is not to write a review, because in reading Graves’s memoir, the thing that struck me most was how much the nature of war has changed, just in my lifetime. The public’s attitudes have changed as well, but not always for the better. I was a teenager in the early ’70s, and thus stared at the possibility of going to Vietnam square in the face. The Vietnam War was raging, and my older cousins and my friends’ elder brothers were drafted into service. Weekly, the television networks broadcast the casualty rolls, listing fifty, seventy, a hundred names of the young American men who had died in combat, just that week. The nation was split into two camps. One camp, predominantly younger folks, was totally against the war. The other, more elderly camp, while perhaps not for the war in Vietnam, still saw it as a necessary evil and supported America’s actions there. America lost 58,000 soldiers in that war—about eleven every day—and to the older folks, the ones who had lived through previous wars, those numbers were not shocking. During the Korean War, about forty-five men died each day; in the Second World War, it was closer to three hundred deaths each and every day. For the younger generation, though, this was unacceptable, especially considering the reasons we were there in the first place. Eventually, the war ended, but as my generation aged we maintained this attitude, and the way we waged war changed dramatically. Since then, the only major conflict has been the combined efforts in Iraq and Afghanistan. Losses have been high (6700+ lives lost), but compared to the conflicts of the ’70s and before, the fact that we lose fewer than two soldiers each day is, really, nothing short of amazing. This is good. In my opinion, the fewer dead soldiers, the better. But I’m not sure it’s all good. Some of us—some of our elected representatives, in fact—don’t seem to realize how horrible war can be. They talk about carpet bombing cities, about turning the desert sand to glass, and I cringe. Have the relatively low casualty numbers of recent conflicts made us cocky? Are we so cavalier about the costs of war, because we have forgotten how much war can really cost? Reading Graves’s account of going “over the top” into no-man’s land, of how hundreds of men were cut down, entire companies destroyed in a night, it makes me think that we may have become too comfortable with modern warfare. War, at its core, is about death. We should never become comfortable with that. Wow. I confess I was shocked to learn from you that the daily death tolls were so much higher in those prior conflicts. I was too young to be paying attention during the Vietnam war, and the others were wars I knew only from TV and movies. Perspective. I’m going to have to ponder this for a while. We’ve been at war over 90% of the time since our country’s birth. Wiki (there are better sources but can’t remember exact sites) lists these. It is also why I wrote a poem about this called, ‘hasn’t stopped the war’. Each generation will be affected by it so it could not, will not, fall short of true contemplations such as the ones here. Thanks for writing this. My grandfather and great uncle both served in WWI. Grandfather was gassed but got off very lightly. Uncle Ed was machine gunned while conducting a cavalry charge. Horses versus machine guns. He was lucky too – merely paralysed. Incidentally I have read I, Claudius and you’re right, it ought to be on everyone’s must read list. My family is lucky, in that our prime youth years occur in between the rather regular periodicity of major wars. My great-grandfather was too old for WWI, my grandfather too young. Same for my grandfather and dad in WWII. I was a squeak too young for Vietnam; the draft was abolished the year I turned 18. Other branches of our family hit every single war with each generation.